Tequila La Parreñita, S.A. de C.V.
Tequila Penca Azul Anejo Limited Edition is the masterpiece of four generations of the Ruiz Family of Mexico. It is the result of 100 years of experience in the art of making fine tequila. Penca Azul is made from the Blue Agave plants, a noble plant that grows mainly in the valley of Tequila and Los Altos region (highlands) in the state of Jalisco. The plants, when ripened, are cooked in brick ovens, fermented naturally and doubled distilled. Finally it is rested in our collection of fine oak barrels for 6 months to achieve a smooth product that will reflect the true balance between Agave and wood spices. This is done in small batch production so that every detail can be supervised to deliver the premium quality of Penca Azul. Destiny and luck brought together Penca Azul with the magic of one of the finest "maestros" in the craft of mouth-blown glass in Mexico. With a tradition of three generations in this art and with more than 30 years of experience, Hipolito Gutierrez put his creativity to work designing and producing a bottle that in its execution can be called a work of art. Since it possesses that sublime mixture of simplicity and refinement. A bottle that can be identified as an excellent piece in glass judged by its pureness and shine. Clear and golden brown with light body, well rounded nose full of fruit and oak. Initial taste of herbs and oak, with hints of butter and caramel. Medium finish with an aftertaste that turns warm and fruity. Well developed anejo, both sweet and spicy througout. My last review of the Penca Azul line (NOM 1115). I'm hoping that it goes through a complete progression. I found myself less than impressed with the blanco and enjoyed the reposado quite a bit more. I'm always wary of tequilas that get way up there in price. Penca Azul añejo is generally around $90-100 a bottle, so it had better be pretty spectacular to merit that kind of price tag. Aroma: A nice balance of green agave notes with light fruit, vanilla and spice. Initial Taste: Complex from the start. There's a grassy and vegetal agave flavor that mixes well with the barrel aging flavors of ripe fruit and light vanilla. Body: Medium bodied, but a bit more thin that I would expect. The fruit comes forward a bit more and the spice notes compliment the agave flavors wonderfully. Great balance. Finish: A medium to long linger with all of the flavors above...but they appear at different times. Spice and green notes at the start. Sweetness and smoke at the end. A unique and tasty finish. This is a unique tequila in a spectacular bottle. It's hard for me to recommend juice this expensive, but if you have the means, Penca Azul Añejo is definitely something worth checking out. It has great balance and flavors from start to finish and a unique profile. The hand blown bottle helps set it apart as well. This one isn't just fancy packaging. This is packaging worthy of the juice inside. Penca Azul does not need my endorsement because it is one of the best Tequila's on the market. I recommend to any and all to have available for friends and family or personal consumption 24 hrs a day 7 days a week year round. This Tequila is like liquid Valium. Enjoy! Tasted out of a double ball glass. I think this is a very good anejo, but I wouldn't say its my favorite of the line. It's a little less intense than the rest of the line. Still, it's no doubt a very good anejo. Aroma: A slightly heated (not as much as rest of line) consisting of earth, spice and lighter hints of vanilla. Initial Taste: A thin mouth feel, a sweet vanilla like entry with no bitterness. Body: A typical awesome 'Penca Azul' agave body, with hints of fruit, spice, and vanilla. Finish: A semi heated finish of short duration and a vanilla fruity lingering. Penca Azul Anejo NOM 1115 Tasted on 6/1/07 at 12:40pm. I purchased 1.5 ounces of this tequila at Centro Cocina Mexicana in Sacramento, CA for $19.75 and tasted it out of a snifter. The tequila is a yellow golden color. 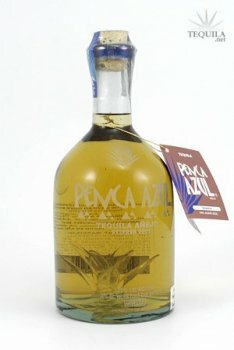 Penca Azul Anejo aromas consist of intense spice, earth, and floral aspects followed by moderate fruit and vanilla. On the lighter side, this Anejo has mild aromas of caramel and smoke. On the tip of tongue, this tequila is mellow and has a shockingly thin mouth feel. While the tequila has heavy agave flavor, it is semi-sweet and has less than a hint of bitterness. The flavor of this tequila contains intense flavors of agave and fruit followed by moderate floral, wood, and vanilla aspects. Deeper flavors of Penca Azul Anejo consist of mild caramel and spice. Upon finishing this tequila, there is a medium duration of flavor and subtle numbing alcohol intensity. I have rated this tequila at 91 out of 100 points.